The largest and best known Czech SPA. The world-famous for its mineral springs, which along with other medical facilities (natural gas and mud), and a wide range of medical procedures has curative effects on human health. The local nature has helped people to renew their strength and to rejuvenate their tired bodies with the help of thermal mineral springs and their ion. The thermal springs, unique in their composition, belong among the most eff ective mineral waters in the world. 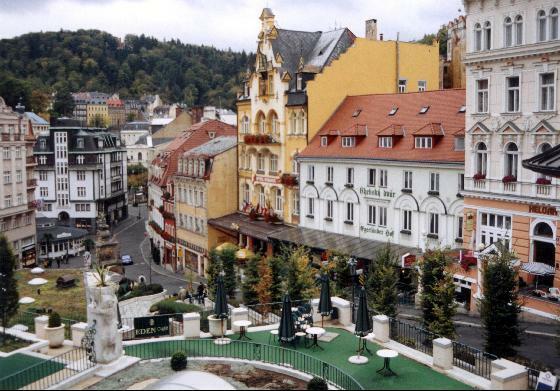 Our agents are experts on Karlovy Vary (Carlsbad). We will help you book any SPA / Hotel in the resort of best prices, as well as transfers from Prague and excursions. MARIANSKE LAZNE is a world-known spa town, the second biggest in the Czech Republic. The town has 40 mineral springs, the best-known is Rudolf's spring. The town is situated in a wooded valley at an average altitude of 630m and it overflows with natural healing sources. 40 mineral water springs rise within a relatively small area and more than one hundred of them in the vicinity of the town. Indication: Diabetes, obesity, allergies, chronic bronchitis and other diseases of the respiratory tract, asthma, scoliosis and other problems of the loco motor apparatus, kidney and urethral problems and others. Spa treatment: Drinking local mineral water, special diet, inhalation, electrotherapy, carbonated baths, paraffin therapy, gas injections, mud wrappings, hydrotherapy, etc. Dead Sea - relax in the waters of this unique sea, feeling weightlessness your tired body. Here, on the sandy shore of the world-famous resort, contemplating biblical landscapes, you can bring your body into a state of harmony and, thus, restore health. This contributing to the special climatic characteristics and therapeutic factors. Unigue environmental conditions, diseases of nervous system, allergic and immunological diseases, drug dependence. Jurmala - one of the most beautiful European resorts. It is located only 14 km from Riga and stretches a narrow strip along the coast of the Gulf of Riga on the 32 km. Jurmala - a SPA town with a long, having 150 years history of tradition. Among city-resort Jurmala is unique compound of three zones - sea, forest and cultural. It has traditionally been a favorite place for those who are attracted by the soft climate, healthful sea air, the combination of the development of recreational and medical base and opportunities for rehabilitation and entertainment. We offer hotels, equipped with advanced medical equipment. Truskavets - unique and extremely attractive balneological resort in Ukraine. Truskavets spread in picturesque valley in the foothills of the Eastern Carpathians at an altitude of 350-400 meters above sea level. It is a city of great natural beauty and crystal clean air. Truskavets recommended for the kidneys and the bile path, urolithiasis. Go to Truskavets! Golden sands - a unique nature, forest, beautiful beaches on Blacs Sea, sun, hot mineral springs. Golden Sands - the best opportunity to rest, entertainment, therapy, sports and new acquaintances. Druskininkai - this green city in the southern part of Lithuania at about 130 km from the capital city of Vilnius, surrounded by fungal forests and beautiful lakes. It is operated throughout the year balneological and mud therapy resort with a continental climate. Budapest is the only metropolis in the world, which is more than 80 hot springs. Thus, in the city are medical fed water baths and SPA. More than half of them are provided therapeutic services. Heviz - the biggest and most famous resort in Hungary. It is located in north-western tip of Lake Balaton. Thanks to its unique nature nature, medical facilities and medical personnel, Heviz became one of the internationally recognized, first class resort and SPA. The unique "city of thermal waters, is situated at the foot of green hills of Tuscany between Florence and Siena. This is one of the most famous resorts in europe. In Montecatini, there are five sources for mineral drinking, three for the reception of the bath and medical procedures.